California's fishing industry was built largely on ‘wetfish', so called because historically these fish were canned ‘wet from the sea', with minimal preprocessing. Sardines, mackerel, anchovy and market squid (now called coastal pelagic species) have contributed the lion's share of California's commercial seafood harvest since the turn of the 20th century. The enterprise of immigrant fishermen founded California's wetfish industry, building up the ports of Monterey and San Pedro, San Diego and San Francisco. Today's wetfish industry is a traditional industry with a contemporary outlook: streamlined and efficient, but still peopled by fourth and fifth-generation fishing families. Today the sons and daughters continue the enterprise begun by their fathers and grandfathers 100 years ago. Transformed from its storied beginning, California's wetfish industry remains an essential part of the state's fishing culture, as well as a key contributor to our fishing economy, producing more than 80 percent of the volume and 40 percent of dockside value of all commercial fishery landings statewide. Coastal pelagic species are also among the Golden State's most important seafood exports. In a state that imports more than 86 percent of its seafood, the wetfish complex contributes close to 80 percent of all seafood exports, helping to offset the seafood trade imbalance. This industry has invested in cooperative research since the beginning of the California Cooperative Fishery Investigations (CalCOFI) in the 1940s, when wetfish fishermen assessed their harvest to help fund the research partnership developed among the California Department of Fish and Game, Scripps Institution of Oceanography and the Southwest Fisheries Science Center (SWFSC). Wetfish industry leadership established the nonprofit California Wetfish Producers Association (CWPA) in 2004, including fishermen and processors who produce most of the harvest statewide. CWPA's mission promotes education, communication, and cooperative research to ensure sustainable fisheries. Today CWPA's research program continues the CalCOFI tradition, collaborating with the California Department of Fish and Wildlife and Southwest Fishery Science Center to expand knowledge of coastal pelagic species. We congratulate NOAA for its vision in building a new state-of-the art science center to expand research on California Current and Antarctic marine resources, as well as today's challenges including climate change and ocean acidification. The SWFSC is uniquely qualified to advance our understanding of the environment, ecology, protected resources and fisheries in California and the southwest region. CWPA looks forward to growing our partnership with the Southwest Fisheries Science Center now and into the future. 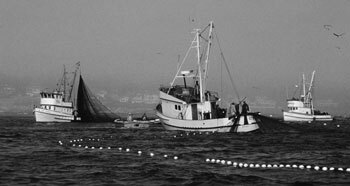 Please visit www.californiawetfish.org for more information on California's historic fishery.